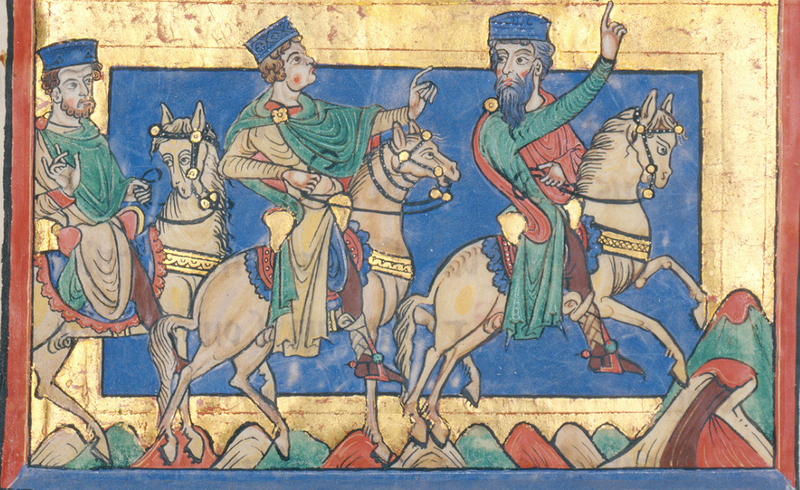 one more day to los Reyes Magos - so one more medieval manuscript illumination we can ponder.. So another High Middle Ages wondrous painting - via Wiki Commons- from Badischen Landesbiliothek in Karlsruhe, Germany. Our three kings are shown in the fashion of the Holy Roman Empire costumes and outfits. Their horses are stallions, all are shod and of uniform grey color. All bridles are similar - with large metal discs for bridle adornments, including the bit, and metal studs complementing the bridle straps. Note that there are no nosebands and bits used are of a curb type. 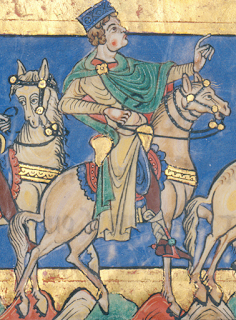 There is large and wide embossed (presumably) but different in design leather brestcollar on each horse. Saddles with the saddlepads and /or shabraques are quite ornate and also uniform; sort of roundish saddle skirts, not unlike many centuries later in Old California or Mexico (mochilla leather covering the wooden saddle tree). Saddles are of high arches type, used for combat with a couched lance and apparently travel too. Unless this high saddle represents the idea of a nobleman saddle in the Medieval art? Some time later we see similar tack features in a three-dimensional Holy Roman Empire sculpted figure at the Bamberg Cathedral - known as der Bamberg Reiter. Riders use one hand to hold the reins, military style but rather loose and thus perhaps indicating neck-reining and highly trained mounts, while seated astride their steeds in la brida (legs extended) style. Stirrups and spurs are present. Note that we see only one cinch on each saddle. 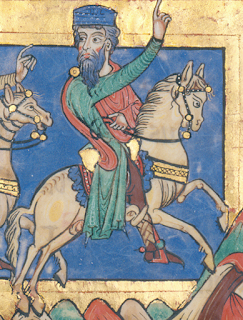 the Codex is associated with the XII century Archdiocese of Trier.